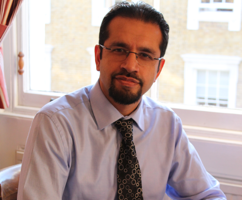 Dr Ahmed Bachelani is passionate about General Practice and feels privileged to be able to help his patients improve their health and sense of well being. Dr Bachelani brings with him a wealth of general medical experience, that enhances his understanding and practice to the benefit of his patients. He lays great importance in listening to his patients and clarifying their concerns. Foremost in his attitude is to address their health priorities in a smooth, professional yet friendly and engaging manner. Dr Bachelani also currently works as a medico-legal expert. His interests include Diabetes Mellitus, its management and complications. Dr Bachelani qualified from the Royal Free Hospital School of Medicine in London in 1997. During his medical training he obtained a BSc. degree in Immunopathology. Subsequently on qualifying he practised as a hospital physician and obtained a postgraduate qualification in becoming a Member of the Royal College of Physicians of London. Thereafter he decided to pursue a career in General Practice. He qualified as a General Practitioner in 2003 and also obtained a postgraduate qualification to became a Member of the Royal College of General Practitioners.